A renewed conscription drive in Eritrea has led to a sharp increase in the number of youths fleeing to neighbouring Ethiopia, a UN refugee agency spokeswoman has told the BBC. More than 6,000 Eritreans had claimed asylum in Ethiopia in the past 37 days, double the rate seen in previous months, Karin de Gruijl said. There has also been a rise in the number of Eritreans reaching Italy. 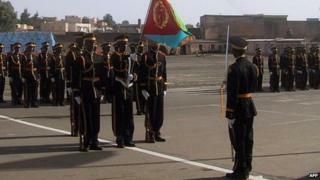 Eritrea says conscription is needed because of tension with Ethiopia. About 100,000 people died in the 1998-2000 border war between the two countries. Eritrea became independent after breaking away from Ethiopia. The refugees, most of whom were between 18 and 24 years old, reported an "intensification" of efforts to conscript them into the army, Ms De Gruijl told the BBC's Newsday programme. "We know that officially national services are for about four and a half years but quite often they're open-ended," she said. "This intensification of recruitment has sparked fear among young people in this age group who don't want to have this perspective of not knowing how long they will have to serve." Eritrean President Isaias Afewerki's government has been repeatedly criticised by human rights activists, who say it is one of the world's most repressive and closed countries. It has little tolerance for criticism and the country does not allow opposition parties, independent journalism or civil society organisations, activists say. Mr Afewerki has governed the Horn of Africa state since independence. Eritrea denies committing human rights abuses and says those leaving the country are economic migrants.